Saint Quartz. This reward can be obtained by claiming it in the master mission section in between November 23, 18:00 JST, and December 14, 12:59 JST. If you do not claim it within this period, you will not receive the reward even if you have cleared the story. A new prologue is now available. you need to have cleared Götterdämmerung in order to play it. Players will now be able to select 3 persons they can "Follow". They can be outside of the friend list or in it. You will now be able to switch more efficiently from Event set and Normal set of Friend List. you can now assign one list to a set (Main or Event), and use the two buttons at the top to change the list directly. Before starting a battle, blue and orange arrows will now show you if your servant will be effective or not according to it's class. Another simple addition to the game that will now show the skill's level when using it. 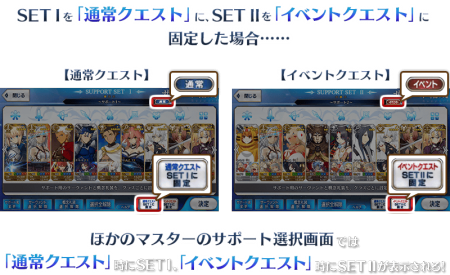 When ascending a Servant to it's last ascension, rather than clearing the menu, it will now be possible to go to the Servant Strenghtening menu, like other ascensions. All Lostbelt (Anastasia/Götterdämmerung) main quests are 1/2 AP. All Part 1 main quests (Fuyuki through Solomon), which are permanently at 1/2 AP, have an additional 1/2 AP granted, bringing the final cost down to 1/4 AP. This page was last modified on 13 December 2018, at 06:02.